Now on sale at Essex Wildlife Trust Visitor Centres, Sculthorpe Moor Visitor Centre, Jarrolds in Norwich, Wild About Birds at Theberton, London Camera Exchange in Norwich, Norwich Camera Centre at Dereham, Kirby Cane Post Office, Grafham Water Visitor Centre and other retail outlets. 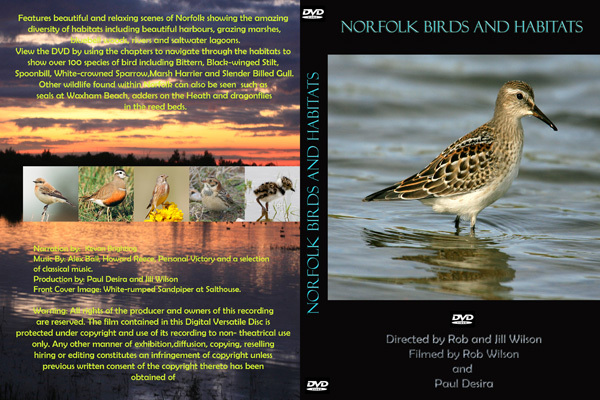 DVD featuring 111 birds, dragonflies, Seals, Adders, butterflies and the beautiful Norfolk Countryside. Travel round the county starting at the coast and moving inland with excellent footage from Cley, Salthouse, Titchwell, Snettisham, Wayland, Whitlingham, Wells, Buckenham, Kelling and Breydon Water. Birds featured are Slender Billed Gulls, Hawfinch, Red Breasted Goose, Sammy the Black Winged Stilt, Bittern, Marsh harrier, Avocet, Black Tailed Godwit, Spoonbill, Ruff, Turnstone, Wood Warbler, Chiffchaff, Common Crane, Stonechat, Black Brant, Curlew Sandpiper, Whimbrel, Lesser Grey Shrike, Snipe, the White Crowned Sparrow twitch and many more. . If you are a retailer who would like to stock this products please contact us.